The most recent items are at the top of the page. Recently, a student I worked with in one of our plays was more curious than most. She had a real appreciation for the handmade, so I promised to make something for her. Because we try to avoid favoritism in the treatment center environment, I knew I would have to wait for her graduation to be able to give her a gift. I'm happy with how it turned out and she was excited to receive it. This was a very fun project, but maybe I should have jotted down what I did so I could replicate it some time. One of the local Native American powwows we love to go to is at Brigham Young University. It was held this last weekend and I found myself inspired by some of the beautiful beading on the dancers' regalia. Some of the traditional women wear woven beaded necklaces or collars. While some are relatively simple in design, I've seen others that extend the netting of beads clear out to the shoulder seams on their outfits. 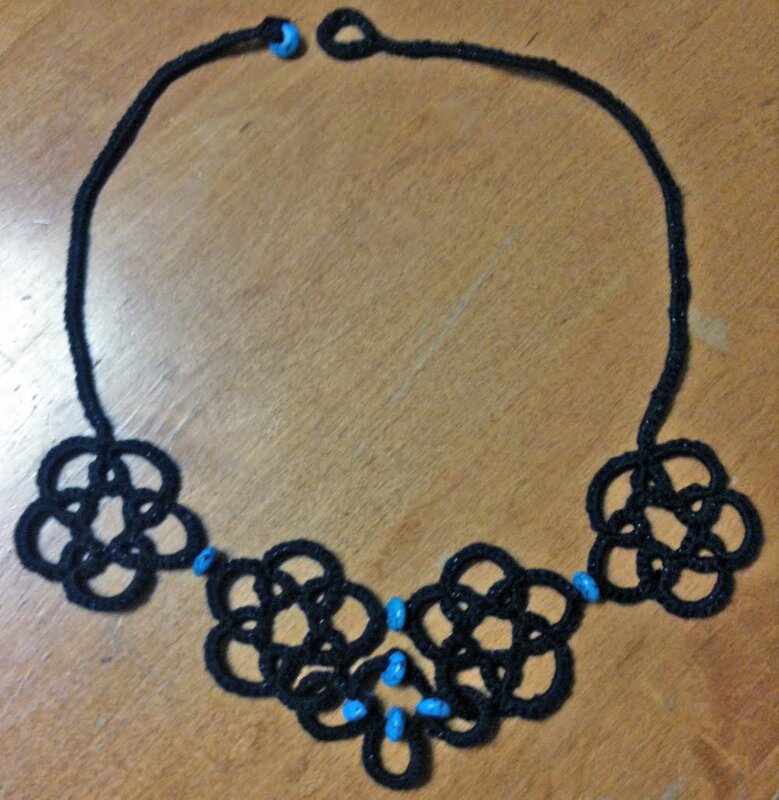 Since I brought along my tatting (of course), I decided to make a necklace with a similar look to those woven beaded ones. 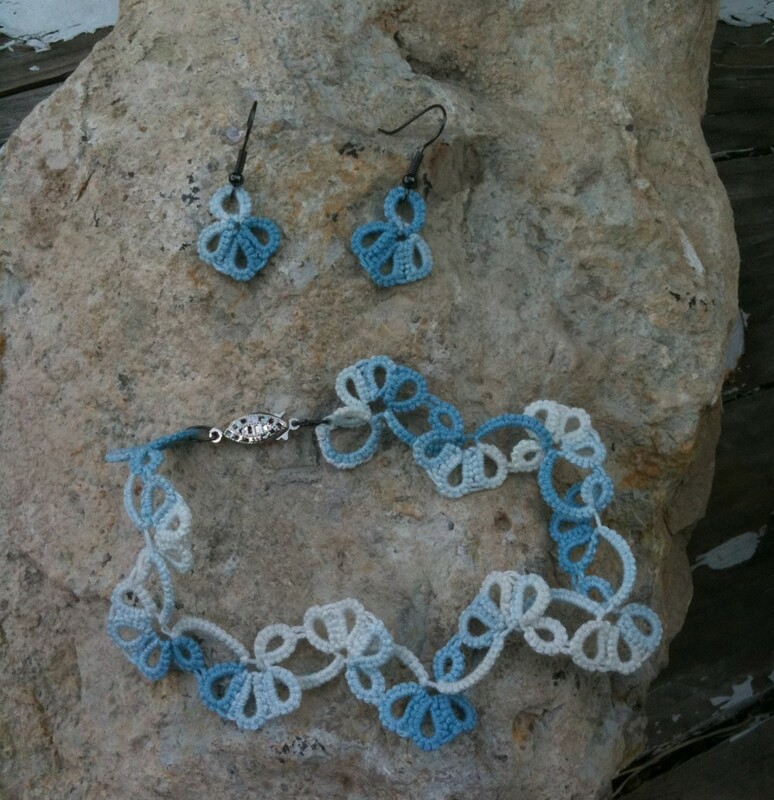 Fortunately, I brought along some beads made from little chunks of turquoise. I used silver and black threads, the Omega rayon type that I've used before. The first round was done with rings in black and chains in silver with the turquoise beads for accents. 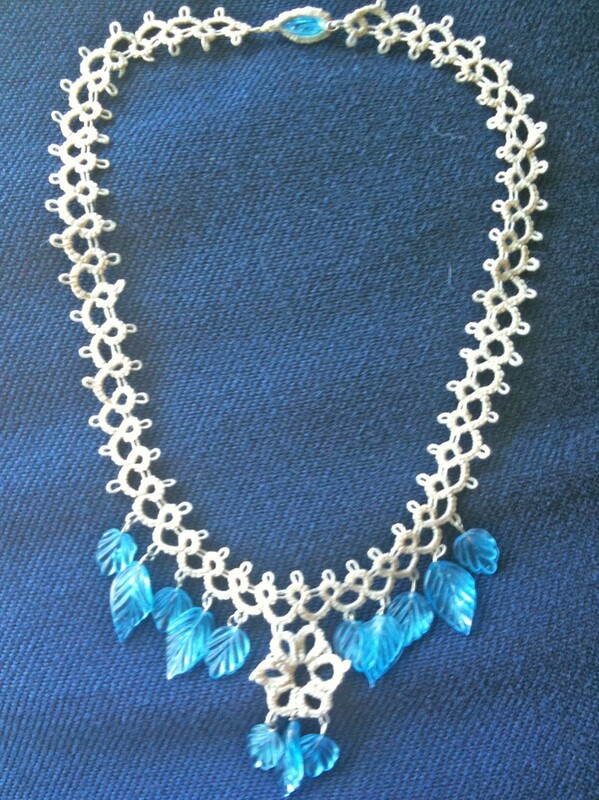 That was too simple for what I wanted, so I added longer chains in black to frame the silver and turquoise. After some playing around with a few ideas, I ended up adding some chains in black thread at the tops of the rings to give the necklace a cleaner look and make it curve more. I'm so excited about how it turned out! My fingers are very sore from pulling rings closed with that rayon thread. It has a tendency to get all twisty and closing the rings will rub your fingers raw. The results were definitely worth it in the end. I even made an adjustable closure for different sized necks. 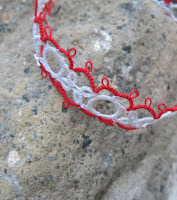 I'd love to hear what inspires your tatting. Leave comments on the original post for this project. 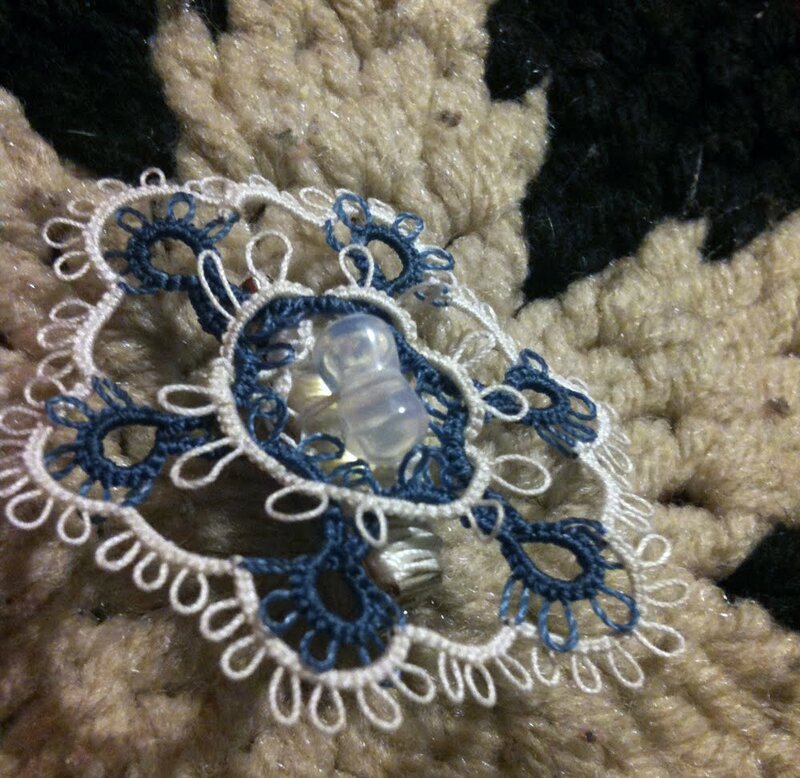 I've gotten a bit carried away with tatting over the glass decor gems I was playing with last week. Glass decor gems are those round, flat, slightly domed pieces of glass that come in a little mesh bag and are used for floral arrangements and craft projects. (They are also great to use as damage counters for playing Pokemon, the trading card game). You won't get to see all my failed attempts since I rarely take pictures as I cut the thread apart. You'd think I would get smart about it and use the same pattern over and over. I just seem to get too restless and keep trying new things. 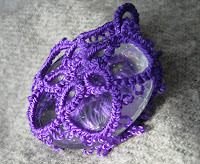 This purple pendant is basically the same pattern I used for the green one I did last week, but I didn't add beads to the joins along the edge of the glass gem. 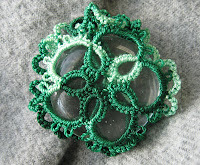 Then I did another green one with the same pattern and then decided to add a ruffled edge to it with a second round. It's actually pretty cool and I will probably do this one again. In an effort to simplify things, I tried a ring only design with the brown Omega rayon thread that has gold running through it. It really shows off the glass gem and I like how it turned out. I tried to do the same thing with the purple thread but worked from memory (bad idea) instead of looking at the brown one. 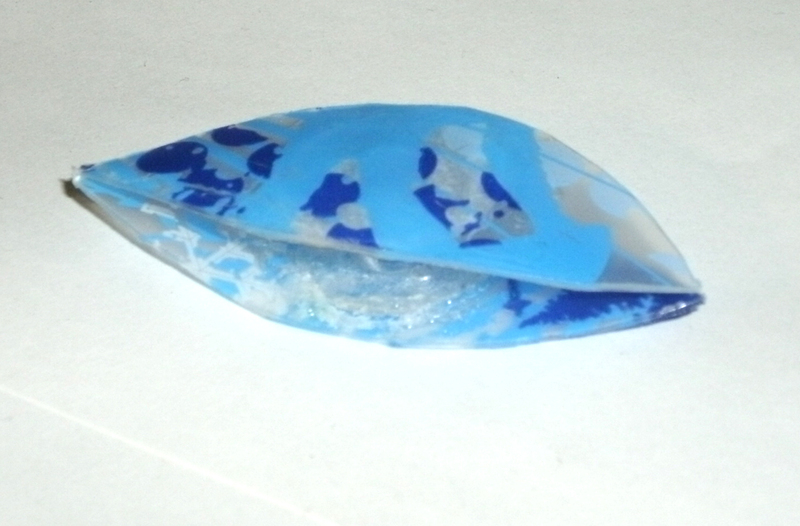 It ended up being too small to fit around the gem and I'm still trying to decide what to do with it. 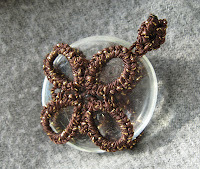 Back to the green thread, I went for a six petaled flower design with rings only and added a green bead to the front. I had this goofy idea to try to make extra motifs that joined to the edges of the pendant to make a more interesting necklace. After making one motif, I didn't like how unstable it was and wished I had joined it in two locations instead of just one. 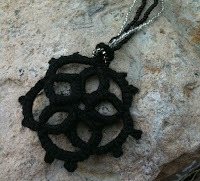 I just couldn't bear to cut the extra motif off, so I folded it over and turned it into a tatted bail for the pendant. I really like the result and plan to do this one again (on purpose). Will I move onto projects without glass gems? Probably not for a bit. 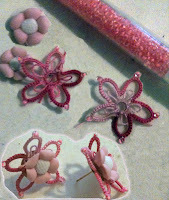 I have a couple of other thread colors I want to play with and want to do more with beads as well. The Omega rayon thread is thick, so I can't do as much with beads as I would like. I made an attempt to blend my husband's Navajo culture with my tatting. 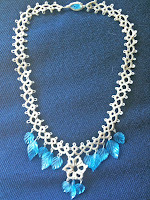 I used a bright turquoise Omega rayon thread and added silver colored seed beads to give it a Southwestern flair. 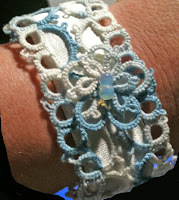 The bracelet is based on the same pattern I made up for the blue button bracelet I made last week. Instead of a button closure, I used a turquoise stone. The turquoise and silver together look really great. 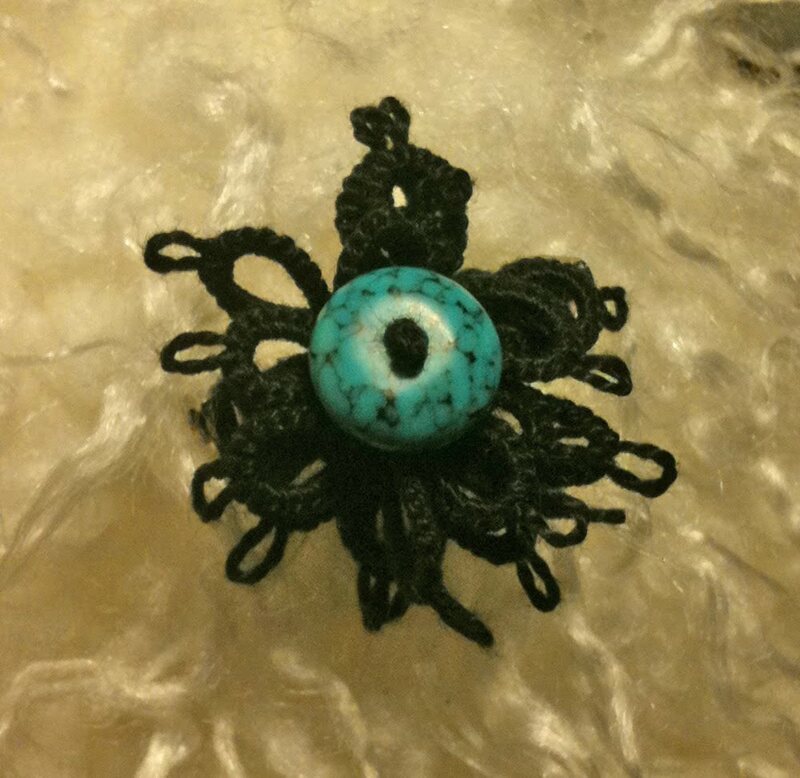 I also made a pendant using the same thread with a five loop beaded flower on the front and a pentagram shape with loops on each point for the back. 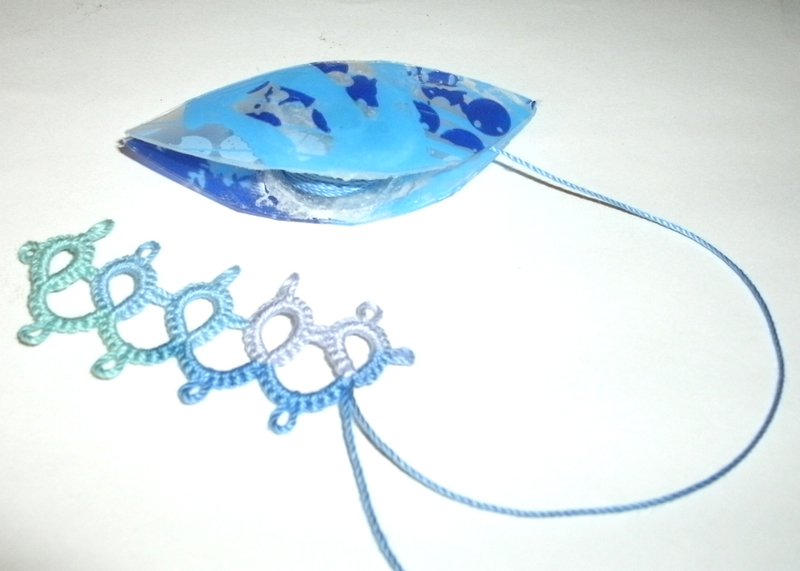 The two motifs are connected with silver beads and encase a domed glass decor gem. The beads on the front are black, silver, and a translucent black, but I didn't add beads to the back motif so it would be able to lay flat. 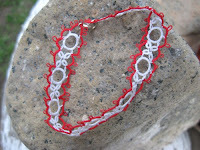 I used a set of four loops/rings at the top of the design to create a tatted bail to hang from a necklace. I played around with tatting around those glass decor gems and came up with something I thought was pretty and not as obvious for St. Patrick's Day. I really like how it turned out and plan to make some more (especially since I want to be able to keep one for myself). 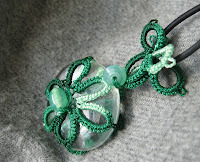 I used a variegated green Omega rayon thread and joined the front and back with pearl colored beads. I thought I'd get a jump on St. Patrick's Day and tried this pattern by Cristina Banyard. This is my first experience with dimpled rings...and maybe my last. I used the Omega rayon thread in variegated thread and had the WORST time getting each ring to close. I decided to make a bracelet to trade with a student I'm tutoring. She saw me tatting once and asked me if tatting could be made into bracelets. I told her it could and she wanted me to maker her one. She likes to make woven friendship bracelets and offered to make one to trade for the bracelet I would make for her. Rather than finding a pattern to work from, I made it up as I tatted. 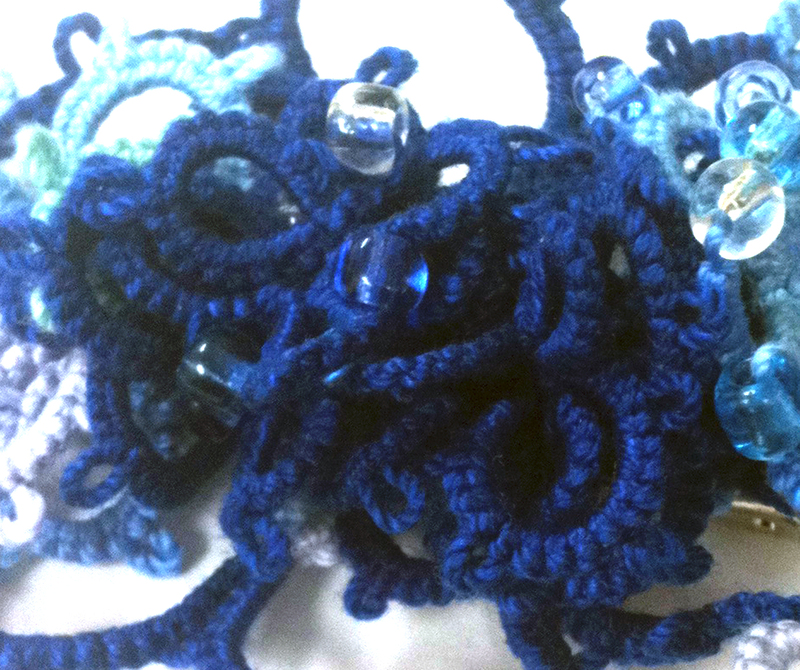 Using a size 10 blue thread, and some beautiful glass beads I picked up, I whipped up this bracelet in a few hours. 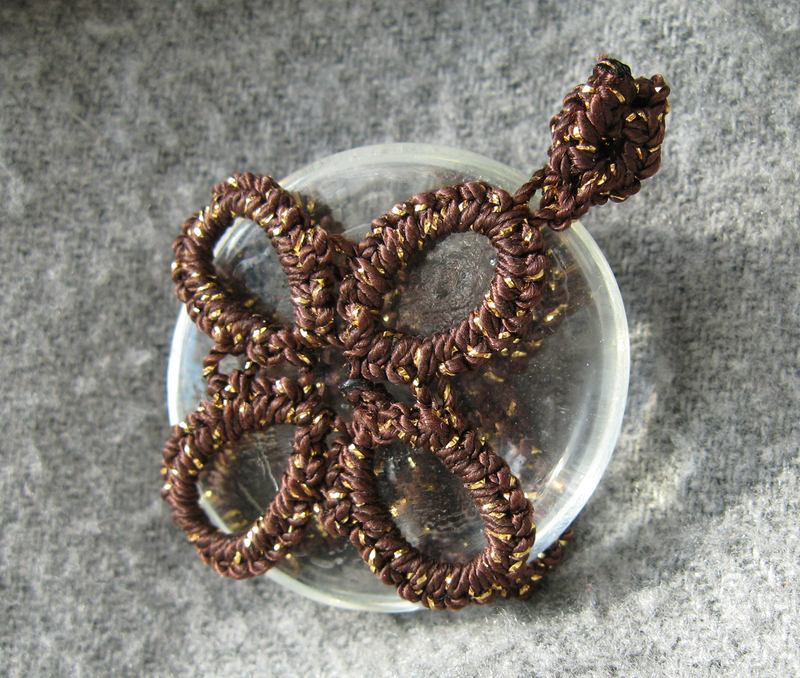 I was happy that the glass beads were large enough for this size of thread, but it was a pretty snug fit pulling the picots through the beads using a tiny crochet hook. Next time I need to remember to make longer picots so it will be easier. My student isn't a frilly kind of girl, so I left the picots on the chains small. It seemed a shame to add a metal closure to it, so I found a blue button that fit perfectly to fasten the bracelet. 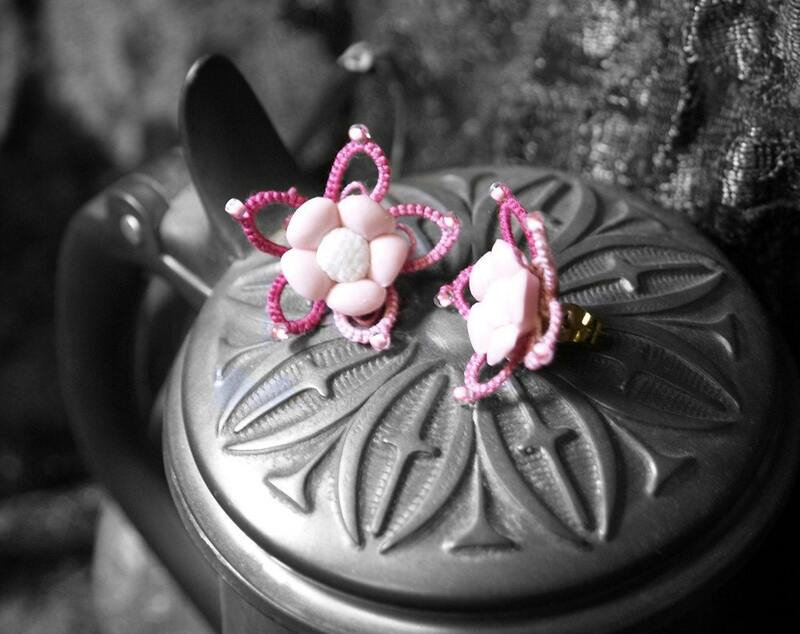 When playing around with tatting ideas, I tried making some hoop earrings. It's a red variegated thread and gives a fiery look that I really like. Unfortunately, as soon as you wear the earrings, the hoop shape collapses. 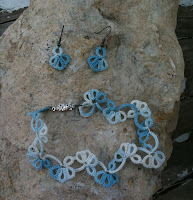 I found some plain wire hoops in my supply stash and wove them into the tatting. The before and after pictures show how much it improved the hoop shape. Now that I have it figured out, I definitely want to make some more. These are the last of my tatting projects from 2010. This purple necklace is a variation of the gold and tigers eye one I did before. I had a request for purple thread and a turquoise bead and it turned out beautifully. Too bad the picture doesn't really do the colors justice. 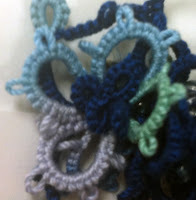 I've been using a type of craft cording I found at Hobby Lobby. It's smooth and I believe it's polyester based. A longer post about these items is on the main page of the blog. Because I was incredibly busy, I was looking for quick projects to do as Christmas gifts. I have always wanted to do Christmas ball ornaments covered in tatting. When we were shopping at Ikea, I picked up some tiny ball ornaments and spent some long nights trying to come up with a pattern. The first one I completed (I should have taken pictures of all the ones I had to cut off the ball) was done with a solid red Guterman sewing thread. The tiny thread just about drove me out of my mind, so I tried it next with a thicker thread that I had been using to make necklaces. I came up with a pattern that worked up fairly quickly and I loved the chunkier thread look. The reactions of my coworkers were so rewarding. One of them started a trend by adding the ornament to her necklace. I made one for myself and then made some matching earrings with little jingle bells on them. When we get close to Christmas this year, remind me to post the patterns. 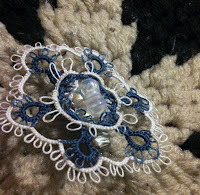 17, 18 Christmas gave me some great opportunities to share my tatting. I hosted an ornament exchange and made a different ornament for each person. My favorite was the basket I tatted in green variegated thread. I even added some beads to sparkle it up a bit. It was so hard to send it off after I made it! The other two ornaments I made were tatted snowflakes. I did one in the green variegated thread and the other in a white and silver thread. I put a tiny jingle bell on the hanging thread for each one to add to the festivity. I received some cute ornaments from two of the ladies I exchanged with, but I don't know what happened to the third one. Continuing the spirit of giving and sharing, I decided to play around on the computer and make something to share with my fellow tatters out there. Have you seen all those "Keep Calm" posters and the variations out there? 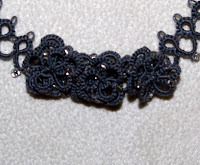 I've been dying to make one for tatting. 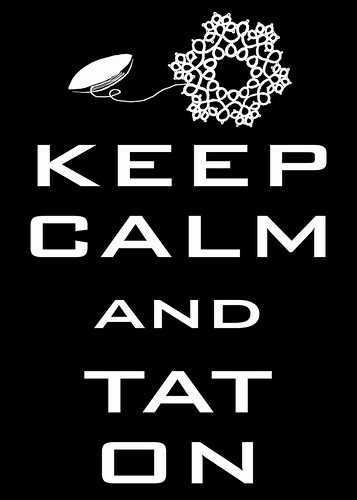 If you like my "Keep Calm and Tat On" poster, click on the picture to get the full 5x7 version that you can print and frame. 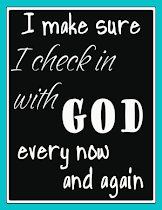 I love these kinds of printables and I hope you'll drop me a note to let me know if you printed it. 14 I went crazy for awhile with the roses. Now I'm going crazy for these star earrings out of Lyn Morton's book. 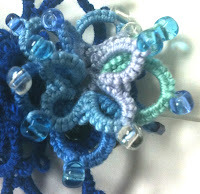 They are loads of fun and easy enough for me to do without always having to look at the pattern. I've done them in a few colors now and wore a pair of gray star earrings to work. Some people wondered if having tatted jewelry meant having to wash it regularly to keep it looking good. Has anyone else had this question before? 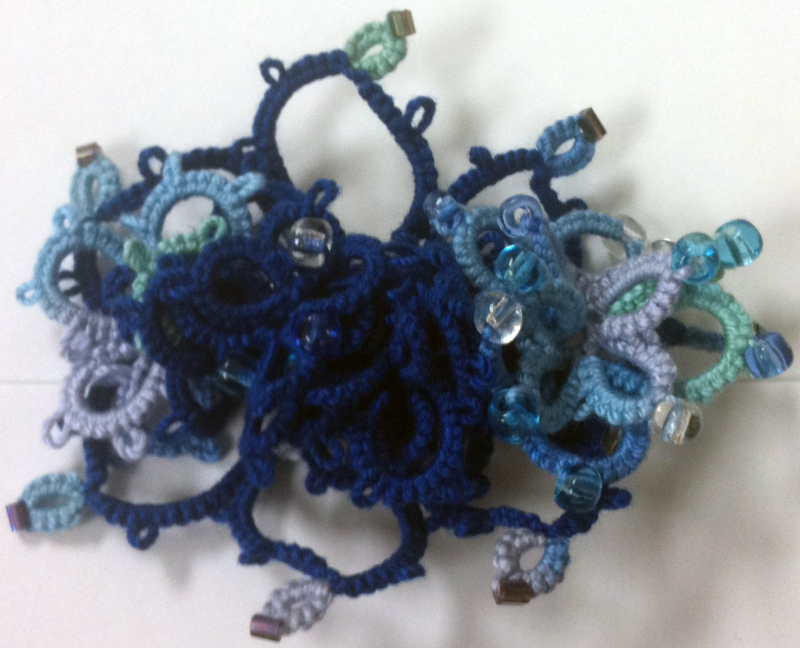 13 I got brave and tried working with seed beads in my tatting. 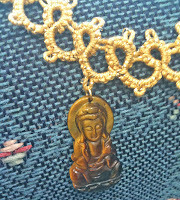 I used gray upholstery thread and tatted up the same Lyn Morton necklace pattern I did previously. With the smaller thread, it took much longer than before. Adding the beads to the picots on the chains wasn't too bad. I wanted to give it a very different look, so I made some roses like I had tatted before. In trying to add beads to the picots between the rings, I managed to break the tip of my Lacis .40 mm crochet hook (sound of me sobbing here). Despite the setback, I was able to find some other creative ways to get the thread through the beads and finish the project. 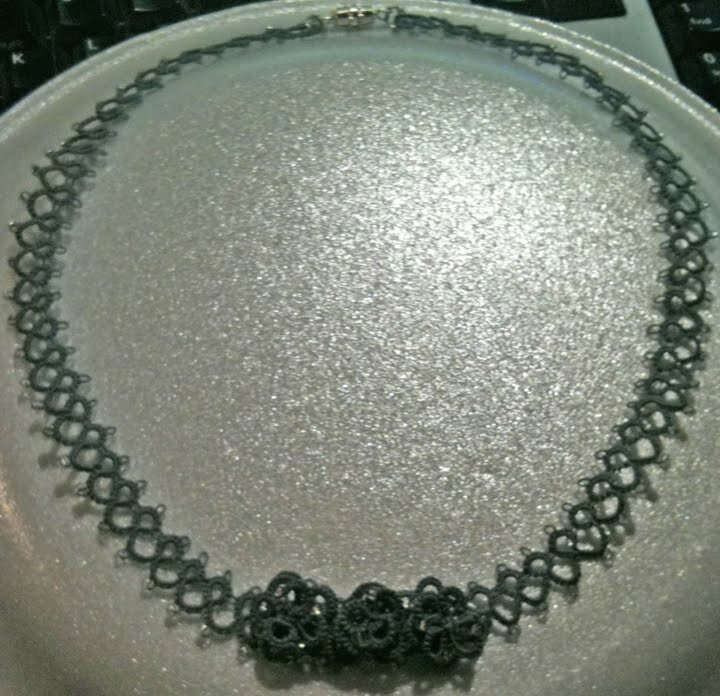 Because I deliberately made the necklace to fit a normal person's neck rather than my chubby one, I won't be keeping it. I love how it turned out, though, and now I'm going to have to make one for myself. It was pretty fun to combine elements from two different patterns and have it turn out like this. 12 Now that I always travel with an "on the go" tatting kit, whenever my husband and I go somewhere, I manage to get at least a little tatting done. On our way to and from the Craft Lake City event Saturday, I tatted up some motifs from the Tatting Patterns and Designs book by Gun Blomqvist and Elwy Persson. They are Star #3 on page 47. I decided to have some fun and use green DMC thread for the shuttle and dark red Guterman thread for the chains. In the book, they are hanging like a heart shape, but I decided to turn them sideways to make some fun earrings. Since I just lost a beautiful beaded earring this weekend because only a single thread was on the earring hook and it managed to slip off, I added a couple of rings so these ones will stay on the earring hooks. 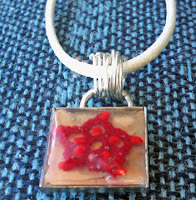 11 I had so much fun making the other necklaces, I decided to make another one. This time, I used a non-metallic thread. 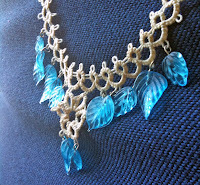 I had picked up some cute glass leaves that I wanted to hang from the necklace. Doing it in white was tempting, but I decided that white thread for a necklace was just asking for trouble. Ecru ended up being the color I used and once again I used the necklace pattern in Lyn Morton's book, "Tatting Patterns." The pattern has now become so familiar to me that it tatted up quickly. 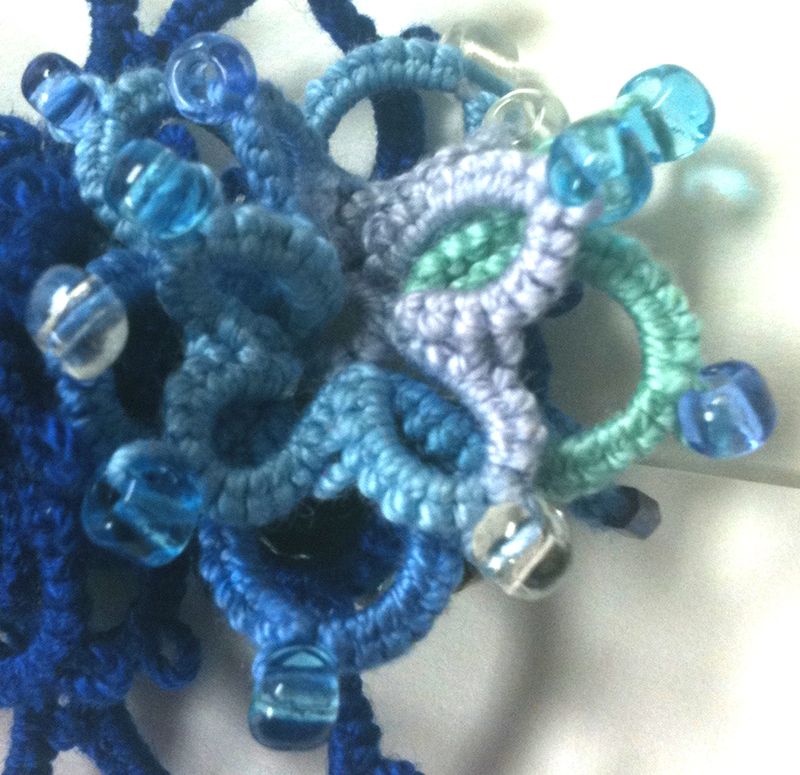 Instead of attaching the flower motif at the bottom by a single picot, I attached it to two picots. The glass leaves hang very nicely from it and make a cool tinkling sound as well. For the closure, I skipped the traditional jewelry clasps I used on the gold necklaces and used one of the leaves and a chained loop. 10 I finished up a couple of necklaces I was working on. They are both based on a necklace pattern in Lyn Morton's book, "Tatting Patterns." I used some gold thread that had a metallic strip and it worked up fairly quickly. 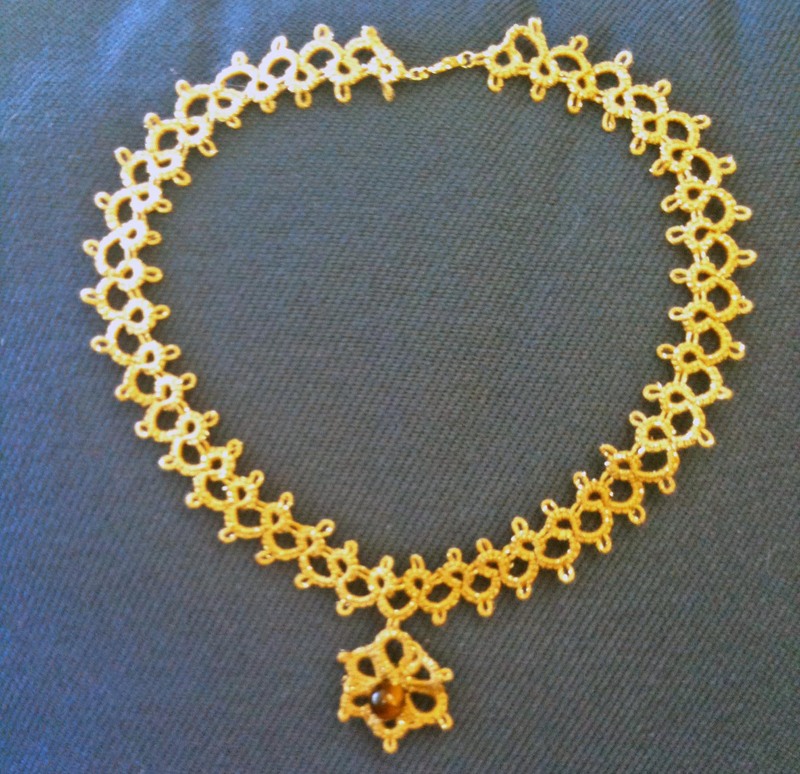 One necklace includes the flower motif as the pendant as it is done in the book. 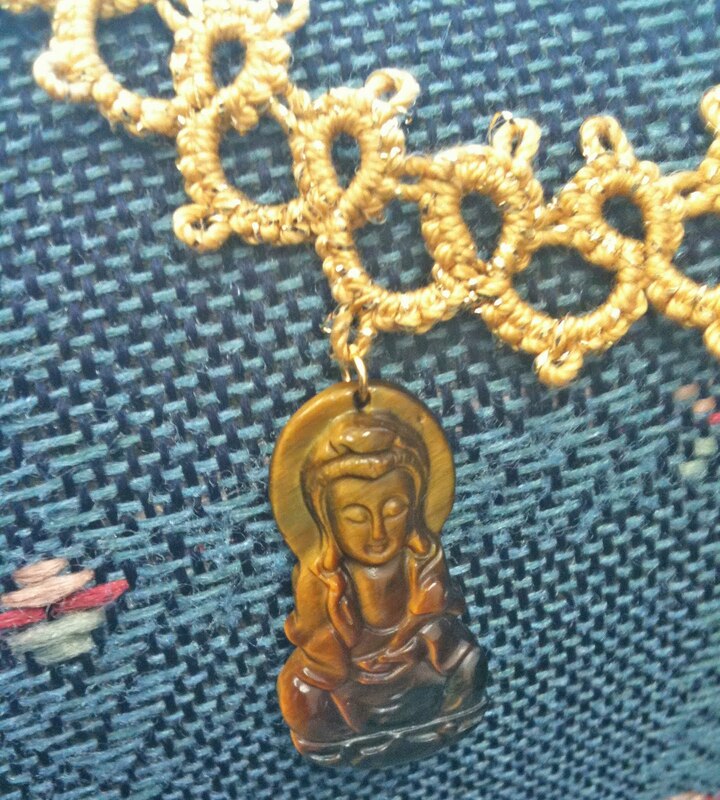 For the other necklace, I attached a Kwan Yin that was hand carved out of tigers eye (one of my favorite stones). I had purchased the Kwayn Yin from Janine616's Artisan Handcrafted Jewelry and Beading Supplies shop on Etsy during a BNR, hoping to tat a necklace to go with it. 9 I played around with making tatted roses. It's from the Eternal Rose Cross pattern by Marilee Rockley. Although I never actually got around to making the cross (maybe next weekend), I love how the roses turned out. 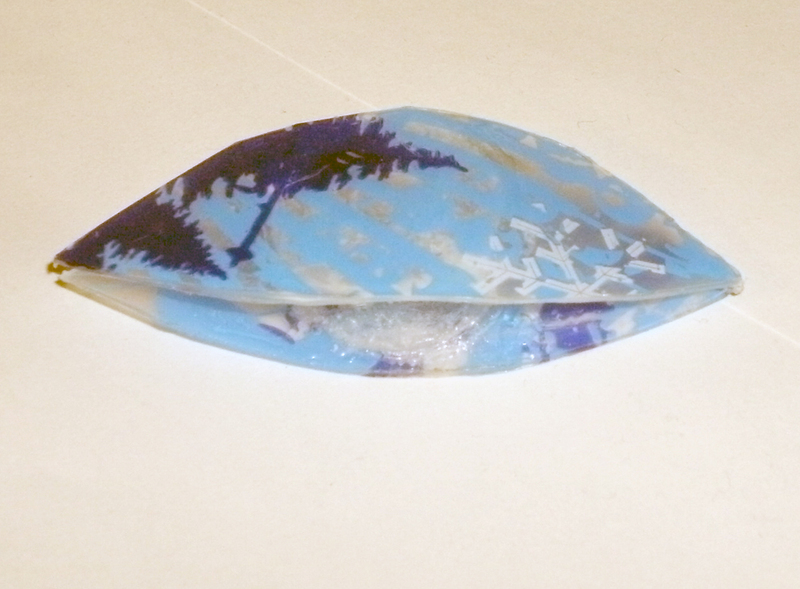 I made one in a variegated blue and turned it into a hair clip for my youngest son's girlfriend's birthday. 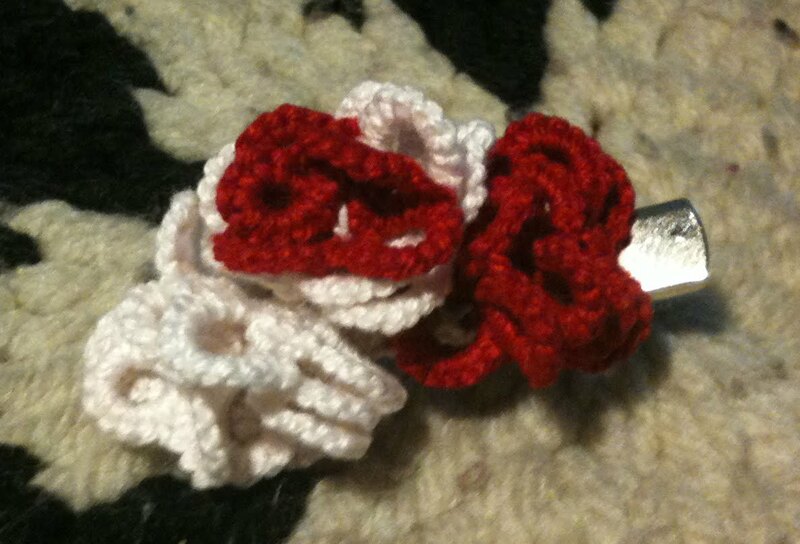 I made some sets of red roses and white roses. I paired some up and glued them to earring posts. The remaining roses, including one that used the remainders of the red thread and the white thread, became a hair clip that I've decided to keep for myself. Pretty much every thing I've ever tatted has been sold or given as gifts over the years. When my mom passed away, it was kind of bittersweet to have one of my doilies back. I'm looking forward to wearing these little roses in my hair. Here are the results of my work on the fishing trip. I used Birgit Phelps' pattern for a Celtic style wreath. The white thread is DMC 80 white thread and the blue is a blue upholstery thread. I thought they looked like the same size, but they weren't. I still like how it turned out, though. 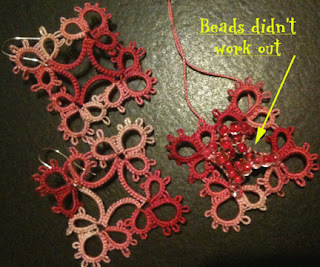 The next step is to take care of the thread ends and block the tatting. I mounted them on pin backs. One is in my shop and I gave the other one away to a reader of my blog. 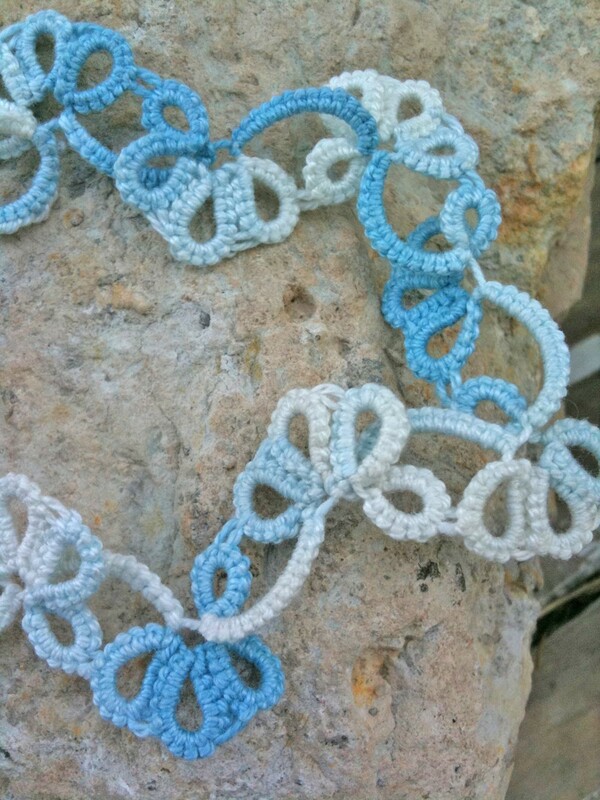 My first experience with incorporating beads into the tatting. The flowers weren't too bad, but there was a lot of trial and error involved in getting the motif in the center to work the way I wanted to. When I started making this flower, I was actually showing a friend what tatting looked like. Then, I saw a flower someone else created that looked layered but was really one piece. I decided to just keep making ring after ring after ring. When done, I secured them to a pin back and added in the turquoise bead. It's a messier look than I'm normally comfortable with, but maybe someone out there will like it. 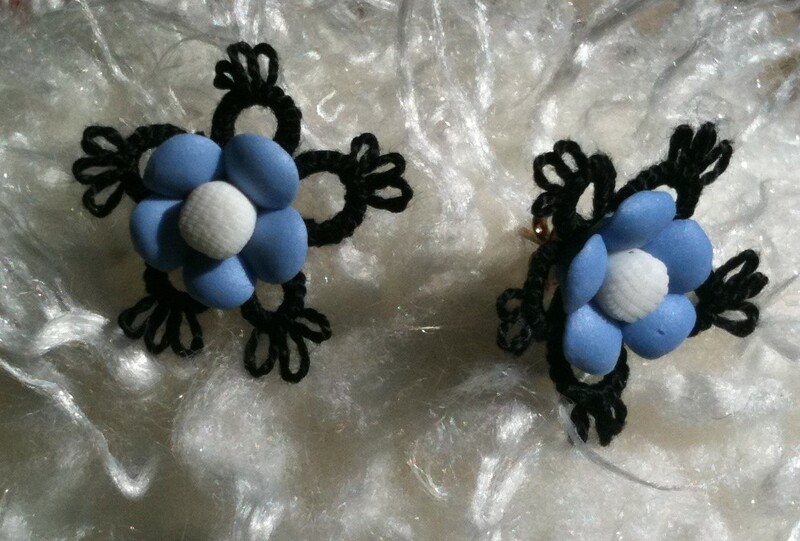 I added ceramic flowers to tatted flowers for these earrings. I made up the pattern as I went with this tatted bracelet. The tatting is sewn to a piece of fabric which is sewn over a metal bracelet form. I like that it's lacy and kind of chunky/funky at the same time. 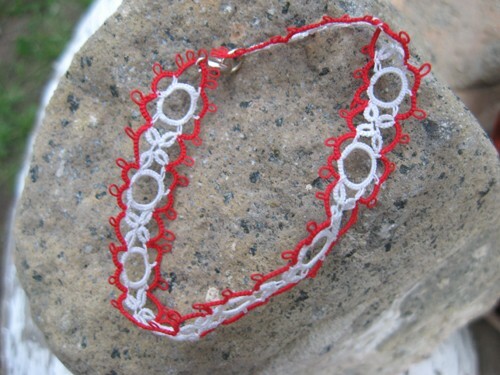 This bracelet was made from a bookmark pattern. I wanted it to be big enough for my large wrist and ended up overdoing it a bit. It hangs loosely and actually looks very lacy. 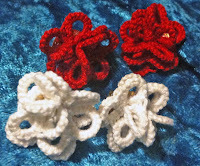 I just conjured up the matching earrings from a part of the bracelet/bookmark pattern. This rosette started based on an Italian pattern I found online that was supposed to cover a coin. I was trying a new thread that was really more of a yarn with sparkles in it and it was much too big for the coin, so it became a necklace all by itself. This is the first tatted item I put in my shop. It's based on a hugs and kisses pattern and I think it's adorable. It's done in smaller thread than my other items, so it looks daintier. 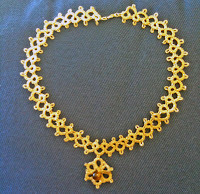 really pretty jewelry, on the first product with your enamel, that was a problem in mixing the enamel with the hardener. When it doesn't set up and is soft like that,it is because there isn't enough hardener to enamel ratio, the proportions weren't the same, even though it might have looked like it, and the cloudy part was probably from stirring it.. There are a couple products on the line that are great just for jewelry making that are also non yellowing, set up nicely and don't cloud up like that. do some research on the net at enamel jewelry sites and find out which ones mix their resins and have worked with a few types to get the best results if it is something you are going to get into. you can have some beautiful results. I can say from experience, the small one from hobby lobby does yellow, and it is expensive if you are only doing one or 2 projects. Wow, you have done a lot of really neat things! I'm inspired to try a few things myself now. 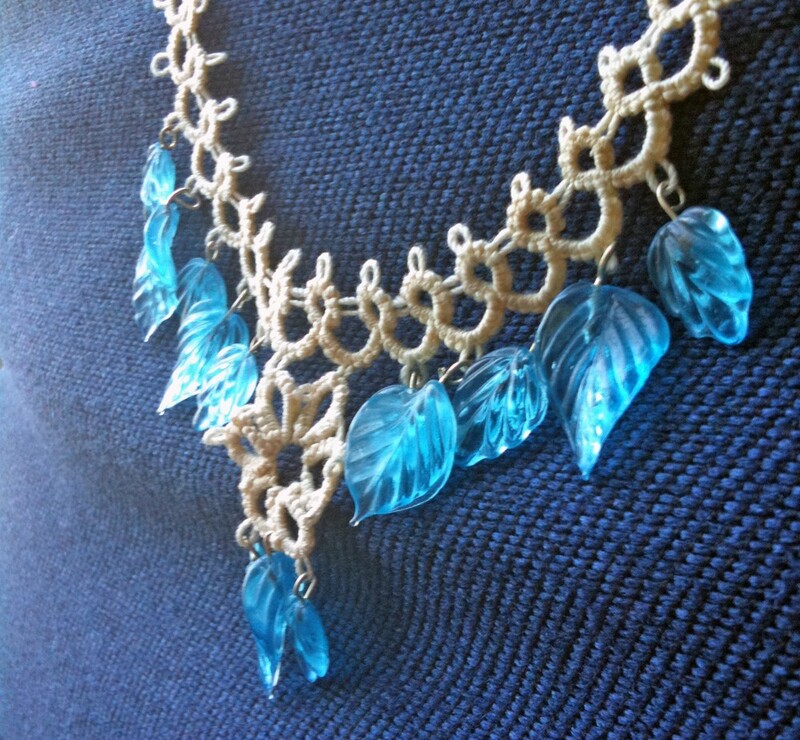 I love that necklace with the blue leaves - beautiful! Bri, that's great advice. Thank you for pointing me in the right direction. This is a dying art form. Your work is beautiful! 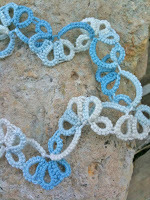 I never heard of tatting, but from what you created I must say simply beautiful pieces!